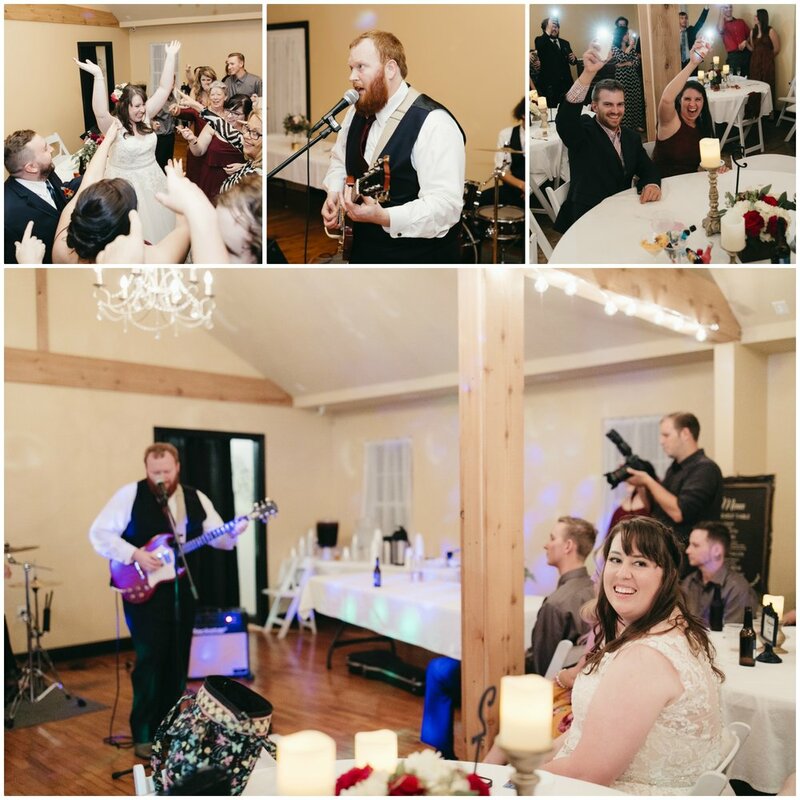 Kelsey and Nigel were married October 14th, 2017 in the small town of Willard, Mo. near their home in Springfield, Mo. The Midwestern couple met online, via the fabled OKCupid, in May of 2013, shortly before the Tinder revolution. Nigel ended up being the first (and only) date that Kelsey needed. They got together for dinner at a burrito place and talked for over three hours, closing the place down. Nigel proposed three years later at a local dive bar where he was performing with his band during an open mic night. It was a blustery January night, but that did not keep away their good friends who got a "tip" and came out to the Monday show, some even driving in from three hours away. Kelsey was in the dark about his plan and, in fact, had recently complained to one of their friends that Nigel had not proposed yet. His band started their set with "The Middle" by Jimmy Eat World and then transitioned into "Thinking Out Loud" by Ed Sheeran. Nigel proposed at the end of the song and the crowd went crazy. "It was like a movie," remarked Kelsey. A week later, the couple put an offer in on their house and started planning for their big day. One of the biggest struggles in the planning process was figuring out who to invite. Kelsey and Nigel wanted to keep everything small and intimate, but also make sure to include everyone important to them. Budget was a challenge here as well and while the couple had originally planned on spending $10,000 they ended up spending $16,700 total for 65 guests. In choosing a venue, Kelsey had a few requirements: not a barn, allows alcohol, and has historic value. The church where they were married was built in the 1880's and was recently restored to serve as an event space. Pinterest helped them pick their colors and plan their decor. They kept everything true to the autumn season with deep, rich romantic tones like navy blue, maroon, gold, and cream. The venue provided chandeliers and they hung string lights for a more romantic vibe. The season and rich colors were also referenced in the beautiful floral arrangements, which included seeded eucalyptus, ranunculus, carnations, roses, and thistle. The bride wore a stunning a-line Mori Lee dress with lace detailing along the bodice and hem and she had flowers in her hair. The bridesmaids wore warm, wine-colored gowns and the groom and groomsmen looked dapper in dark blue suits from Men's Warehouse. Good food was a must for both Kelsey and Nigel and their caterers knocked it out of the park. They had a legendary dessert table, which included cream puffs, macaroons, fruit tarts, and baklava! Nigel and his band made an appearance during the reception and played a short set, including the songs from the proposal. They surprised everyone again, even Kelsey. Nigel's most memorable moment during the wedding was their First Look. It was a good moment to calm down and take in the day and where they were in relation to not only their impending vows, but their relative space in the universe. "He was there for one purpose, to see me in my wedding dress," said Kelsey. "He said he felt enamored and lucid." Kelsey's favorite part of the day was their vows. "I had constant tears in my eyes," said Kelsey. "I just kept thinking that I'm really actually marrying the love of my life."